This letting agreement is for any property with a commercial kitchen. That is, a restaurant, café, delicatessen or fast food outlet. The lease allows for the property to have space used for other business purposes too, such as offices above. Term: 1-7 years. Features: guarantor; break provision; rent review options; option for assignment; sub-letting not allowed; ss 24-28 opt-out; draft agreement for security deposit; schedule covering kitchen and cooking equipment.draft agreement for security deposit; schedule covering kitchen and cooking equipment. This agreement should be used to let a food retail unit such as a restaurant, cafe, delicatessen, or fast food outlet. It may be part of a parade of other shops owned by other landlords, or it may be stand-alone. The restaurant or cafe may have additional space used by the tenant for other business purposes, such as offices or storage. This lease does not cover additional space let for residential use by the tenant, although Net Lawman does provide one that does (see below). Provided the term of the lease is seven years or less, it does not need to be registered at the Land Registry. If you are still not sure, there is more information in our article: Which Net Lawman business lease? 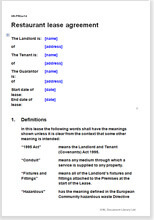 Commercial lease law is regulated primarily by the Landlord and Tenant Act 1954, amended many times. The law governing commercial leases is substantially different in Scotland as compared with England, Wales and Northern Ireland. In Scotland there is no equivalent to the Landlord and Tenant Acts. There is little legislation or case law relating to leases in Scotland. So the version we have drawn for our Scottish user is common law based. On registration of leases in Scotland, only commercial leases for longer than 20 years must be registered in the Land Register of Scotland. However, the lease is often registered in the Books of Council and Session in Edinburgh. For the Scottish version of this lease please select "Scotland" from the list in top box.